Ross McCormack gave the visitors an early lead after Matt Smith's knock-down found him free inside the area and he fired low past Luke Steele for his 29th goal of the season. Barnsley never seriously threatened to drag themselves back into this Yorkshire derby. Home keeper Steele was called into action to keep out a header from Smith and Luke Murphy was the next to threaten for Leeds, as he saw a header blocked. Leeds defended their lead well during the opening 45 minutes, restricting Barnsley to a solitary effort on goal - a looping header from Dale Jennings that was easily gathered by keeper Jack Butland. Tomasz Cywka also volleyed wide from a cross from Stephen Dawson. Early in the second half, another tame Jennings effort was easily saved by Butland and team-mate Kelvin Etuhu then saw his shot blocked before putting the follow-up well wide. As the visitors began to press forward in search of a second goal, Smith found the target with a header from Tom Lees' free-kick but could only direct it straight at Steele. For Barnsley, Jennings saw another header saved by Butland and Liam Lawrence put a 25-yard effort over the bar. But Noel Hunt threatened to find a way through at the other end before being blocked by Jean-Yves M'voto and it was Leeds who looked the likelier scorers in stoppage time - McCormack firing a low drive wide of Steele's left-hand post. Barnsley manager Danny Wilson: "It wasn't a good result, obviously, and it doesn't make it any easier, but who said it was going to be easy anyway? "We thought it was going to go right to the wire and I think I'm right. We didn't offer enough quality and I thought the game was poor. "There were not a lot of chances and there was one bit of quality. Of all the people for it to fall to, it was McCormack and you didn't want it falling to him with the form that he's in at the moment. That was the difference." Leeds United boss Brian McDermott: "I think it was well deserved. "I think the game was separated by a bit of real quality. Ross's first touch was fabulous and then a great finish. "He's a match winner and those players are very, very important. He took the one chance that made the difference. He's right up there as a finisher." Match ends, Barnsley 0, Leeds United 1. Second Half ends, Barnsley 0, Leeds United 1. Attempt missed. Ross McCormack (Leeds United) left footed shot from outside the box misses to the right. Assisted by Michael Tonge. Offside, Leeds United. Scott Wootton tries a through ball, but Ross McCormack is caught offside. Attempt missed. Ryan McLaughlin (Barnsley) right footed shot from outside the box misses to the left following a set piece situation. Liam Lawrence (Barnsley) wins a free kick in the attacking half. Substitution, Leeds United. Aidan White replaces Matt Smith. Attempt missed. Liam Lawrence (Barnsley) right footed shot from outside the box is high and wide to the right. Assisted by Tomasz Cywka. Attempt blocked. Matt Smith (Leeds United) right footed shot from outside the box is blocked. Assisted by Ross McCormack. Substitution, Barnsley. Nick Proschwitz replaces Stephen Dawson. Delay in match Ross McCormack (Leeds United) because of an injury. Tomasz Cywka (Barnsley) wins a free kick in the defensive half. Foul by Ross McCormack (Leeds United). Hand ball by Stephen Dawson (Barnsley). Attempt saved. Dale Jennings (Barnsley) header from the centre of the box is saved in the top right corner. Assisted by Stephen Dawson with a cross. Attempt saved. Matt Smith (Leeds United) header from the left side of the box is saved in the centre of the goal. Assisted by Tom Lees. Foul by Patrick McCourt (Barnsley). Luke Murphy (Leeds United) wins a free kick on the right wing. Substitution, Barnsley. Patrick McCourt replaces Kelvin Etuhu. Attempt blocked. Michael Tonge (Leeds United) right footed shot from outside the box is blocked. Attempt missed. Ross McCormack (Leeds United) right footed shot from outside the box is too high. Corner, Leeds United. Conceded by Thomas Kennedy. Substitution, Leeds United. Noel Hunt replaces Marius Zaliukas. Attempt missed. Kelvin Etuhu (Barnsley) right footed shot from outside the box misses to the left. Attempt blocked. Kelvin Etuhu (Barnsley) left footed shot from outside the box is blocked. Assisted by Stephen Dawson. Attempt saved. Dale Jennings (Barnsley) right footed shot from the right side of the box is saved in the bottom right corner. Assisted by Chris O'Grady. Corner, Barnsley. 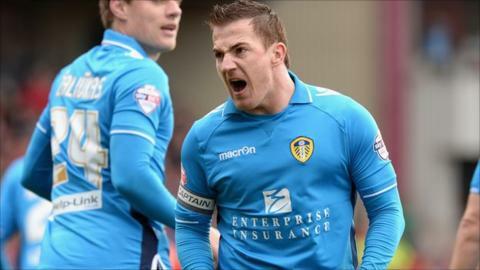 Conceded by Ross McCormack. Luke Murphy (Leeds United) is shown the yellow card for a bad foul.